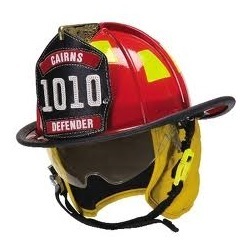 The Cairns® 1010 traditional fire helmet offers a tough, through color, DuraGlas® fiberglass and high-temp composite resists cracking and chipping and provides a perfect combination of durability and performance in a lightweight, high-performance design. Traditional style with high-tech performance. 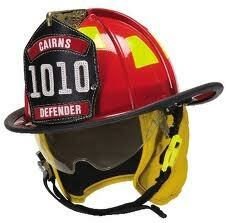 This model available online in White or Black with Defender Visor, Standard Yellow Nomex Ear Flaps and Silk Screened Eagle. Other options available for special order. Please call 860-442-0678 for more info!